Embark on the mother of all pub crawls to explore 45 of Australia’s best boozers. From remote country watering holes to pubs within cooee of the major towns, you’ll never be caught short of a drop again. They’ve always been watering holes. Places to swap tall stories and forge that legendary “Aussie mateship”. These days, classic country pubs may have morphed into places you dress up and go out to for a good meal plus a night of entertainment. But, even now, the pub is the hub of most country towns. It seems every country town has a Railway Hotel, a Grand or a Royal, a Criterion or a Commercial. There are Crown Hotels in many places, as well as Exchange, Globe, and Imperial Hotels. And while Aussie pubs seem to be a bit more low-key in their naming, there is the Magpie and Stump in Mintaro, South Australia, the Cauliflower Hotel in Sydney, and even one named for a dog in outback Queensland. The stunningly scenic “back road” to Macksville passes this Aussie icon immortalised in the song that was written here and later sung by Slim Dusty. Now it’s Murray Brewing Company’s base and those sweeping views are certainly worth toasting with a beer out on the veranda. The “Tumby Pub” just off the highway on the banks of the Tweed River is a family pub. It was the first here, licensed in 1887 and now has a fine bistro that makes the most of the location. There’s a touch of bush culture in this circa 1883 pub way out in Corner Country. The walls inside are covered with pretty priceless sketches. In 1960 Clifton Pugh befriended the publican and did some high-class graffiti for him. Other artists include Richard Armor, Russell Drysdale and Eric Minchen – but if you’re good enough you might be allowed to add something too. Ask about the story behind all the money pinned to ceiling at this circa 1887 NSW Southern Highlands inn. They’ll tell you – but our guess is that it’ll be for a price! This is also Babe territory, as if you could forget. Sometimes goes by the name “the Country Inn”, but don’t be fooled; it’s the same place. Who says pubs have to be heritage? These two new NSW hotels bring a touch of the Blarney to the Hunter and Taree regions. At Harrington Waters, don’t blame the drink; those really could be dolphins you’re seeing frolicking in the river. Since being taken over by Justin Hemmes and given a ‘Merivale makeover’, this place looks a little different. Still with remnants of The Newport Arms you remember and love, downstairs, The Newport has turned into a food market of sorts, complete with burger shack, pizzeria, cafe and Japanese seafood offering. It still has a [now amazing] play areas for kids, renowned restaurant Bert’s is located upstairs – and of course, it still has some of the best views in the state and 125 years under its belt. Here’s to many more. Near Brunswick Heads, Byron Bay, this is the real deal – a traditional pub, beside the former rail track. Ma (short for Margaret) Ring was Australia’s oldest publican, having served here for 53 years until her death aged 101 in 1983. The place is still full of old things and pub-obilia. Most locals call it the “Uki Pub”. It’s out the back of Murwillumbah and you step back in time at this place – just a classic pub in the breathtaking foothills of Mount Warning. Actor Jack Thompson is a true-blue Aussie bloke, so who better to rehabilitate this Art Deco beauty, built in the Blue Mountains in 1910? Quite rightly, the centrepiece of the hotel is its classic Australian “Long Bar”. Lots of historical photos in the bar of this bushranger-country pub (John “Happy Jack” Gilbert was finally cornered by police in the area and shot dead in 1865), but many people come just for the food. It’s been said that the chef here cooks the best steaks in Australia. See what has attracted so many producers and filmmakers to this remote spot beyond Broken Hill. The old pub’s walls are packed with photos taken during the various shoots, and most of the locals have had their moment of fame as walk-ons or extras. Hosts a classic outdoor BBQ on Sunday nights, cooked by publican and local legend Roly Gooding, as well as loads of comfy accommodation. Also shirks a jukebox and TVs in favour of good old-fashioned yarns at the bar. With a town population of six, you’d wonder where the other drinkers come from. But they do! Especially for New Year’s Eve. Queensland’s oldest hotel, on the banks of the Moonie River (fishing allowed), has been dealing with thirst since 1864. Check out the collection of donated Akubras and try to spot the police hat. You’ve heard of the pub with no beer. Well, this outfit in far southwest Qld bills itself as the “pub without a town”. There’s more dry outback humour at the bar. Drink with the opal miners and farmers or play nine holes on the sandy golf course. Check the website for the fascinating story of the beginnings of this imposing place. Queen Elizabeth II has stayed here, as well as the English cricket team, Rod Laver, Lew Hoad and Ken Rosewall. During WWII it was HQ for the generals planning Australia’s defence in the Pacific. In Queensland’s far north, it would be hard to find a more beautifully restored Federation hotel, built by the Queensland Government in 1917. Grand colonial verandas are ideal for relaxing with a drink before the rainforest and mountain views. Big signs on the highway heading towards the NSW border announce “Historic Hotel”. The Californian who built this a century ago believed (wrongly) the area was volcanic, so he chose steel and concrete. Recently revamped, it has new life in it, and really buzzes. This pub is believed by most to be the place where Banjo Paterson’s Waltzing Matilda was first performed in public in 1895. Local sculptor Daphne Mayo has sand-etched the song’s chorus and a picture of the swagman on the hotel’s glass doors. Toast the hotel’s namesake, the legendary Australian working dog, and search for famous signatures on the walls. The “champagne window” immortalised in Banjo Paterson’s poem “Goldenwater” is here too. And Waltzing Matilda’s famous billabong is nearby. Matilda Highway, Kynuna, 07 4746 8650. Once called the Gidgee Bug, and after that the Federal, this is now one of Australia’s most famous watering holes. It’s Mick Dundee’s pub, having featured in all the Crocodile Dundee flicks. Sold soon after the first movie, the heritage-listed boozer still has that authentic Dundee feel to it. Everyone has heard of the Birdsville Track but not everyone gets out this far, near the Qld, SA and NT borders. If you do, check out this 1884-built pub that has seen it all. To fast track your visit, there’s an airstrip right out back of the pub. Want to get away from it all? Then this is the place, the pub – and town – that’s officially furthest from the sea in Australia. Appropriately, Eromanga means “hot, dusty plain”, and the pub was built on one in 1885 from locally made mud bricks. This tiny iconic pub, the oldest in the Territory, has been welcoming travellers since 1893. It also has one of the first airports in Australia, which once serviced planes on the London-Singapore leg. During WWII it was used by the Australian and American air forces. Famous as a break for drovers moving cattle between Alice Springs and Darwin, it’s now also a bank, post office and police station. An absolute classic. The word from sports nut Matt Cleary, one of AT’s 100 Best Towns panellists from the April/May 2009 issue, is that “dress rules at the Humpty Doo Hotel are pretty much ‘Must Wear Pants’. Has arguably the best Sunday Session in the Top End. And is near a good little golf course.” Also has the largest set of buffalo horns in Australia up on its wall. Good enough for us. With the best beer garden outside of Darwin, you’ll be absolutely dying for a drink by the time you reach this oasis on the banks of the Adelaide River. Not just a shrine to Charlie the Buffalo from Crocodile Dundee, you can also order up tasty buffalo steaks at the counter – and the Barra ‘n’ chips is also worth the drive. Short on people (local population is around seven) but big on hospitality, you may find yourself downing a coldie beside a film crew – the area has featured in many ads and films – or someone who’s driven in one of the utes parked out front. Be sure to try the Flinders Feral Food. It’s famous and fantastic. This hotel on the Yorke Peninsula, where the ferry crosses to the Eyre Peninsula, is just what the locals ordered. The Coopers Ale House is especially popular and you can eat or drink with great views of the beach or cove. Better still, you can snack on the local seafood. People who have heard about this place have heard that the food as well as the wine list are two very convincing reasons to visit this lovely beachside location. As well as beer, it’s said to have one of SA’s best cellars. Out here in the middle of nowhere, Phil’s your man. He can pull a beer, change a tyre or yarn about anything. And if you’ve come this far, be prepared to stay a while. The traffic light will give you time to decide. And then there’s that hat collection! Around 1000km northwest of Adelaide, the William Creek Hotel is pretty much the whole town. Part garage, part landing strip, part hotel, part campground but definitely all Australian, its walls and ceilings are covered in all manner of pub-obilia left by travellers. Add your own before moving on. The name gives a hint. This is a pub where you’d least expect one. “Come and see our Beer Drinking Pig” says a sign when you’re almost there. And yes, there is a pig. And yes, it drinks beer. What else would you expect to see on the walls of the public bar in the remote north of Tasmania? Tassie tigers, of course, cavorting around while you read the collection of newspaper clippings about tiger sightings in valley. A bit chilling if you’re planning a moonlight walk. Built from local sandstone a year prior to the old Ross Bridge, it’s a classic Tasmanian heritage boozer in the old style. 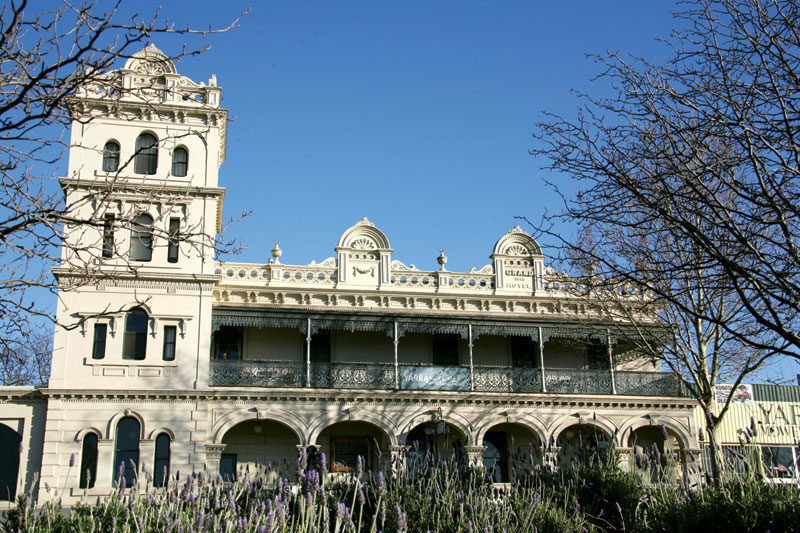 This was one of the first grand hotels in Victoria, born from the gold rush, so it’s hardly a “pub”. Established in 1853, its hospitality and service made it the venue for poets, princes and prime ministers. This place on the outskirts of Geelong has long been a popular meeting place for young country people, and is now forging a reputation for its restaurant food in a country pub atmosphere. a microbrewery on site, with the award-winning Dirty Angel so far the standout beer. More like an English pub with a steak and seafood restaurant and a microbrewery. No chance of boredom here on the Mornington Peninsula with an extensive collection of anything and everything to do with pubs – including more than 100 different beers. Actors Alison Whyte and Fred Whitlock used to own the Terminus Hotel in Abbotsford but a business tree-change saw them taking over this circa 1888 heritage-listed hotel in the Yarra Valley. Rustic, charming and draped with wisteria, this is northeast Victoria’s answer to Provence, just up the road from Beechworth. There are open fires to combat the chilly winter nights and a leafy garden for summer. All this and local handcrafted beers on tap. This is the pub that almost died. Late in 2008 hundreds of people joined a Facebook campaign to save the cute century-old pub north of Port Campbell when it closed unexpectedly. Good news is, the beer is flowing again. 2 Curdievale Road, Timboon, 03 5598 3021. Before he was US President, Herbert Hoover was a regular guest of this grand gold rush hotel. His mirror and a poem he wrote to the barmaid he loved remains. Meanwhile, the vibe of this mining town lives on. 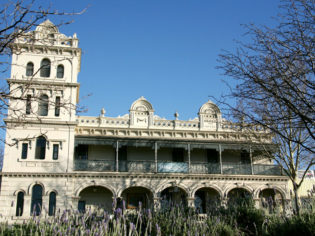 “The Freo”, with its iconic spire, is an institution. Popular with everyone – surfers, fishermen, miners and visitors – there are 16 beers on tap and excellent seafood to be had. The Long Bar of this renovated heritage-listed hotel near Margaret River somehow manages to blend Art Deco with surf-chic. The classic polished bar pays homage to the local long board surfers. Another pub salvaged. After this timber-cutters’ pub deep in jarrah forests 100km south of Perth was the only building to survive the town’s devastating bushfire in 1961, it was bought by the community, and remains the only community-owned pub in WA. In the Pilbara region of far northwest of WA, this century-old shocking pink corrugated iron pub has survived cyclones, white ants and much more. Once it even had a camel that loved drinking beer, and a python that lived in the rafters and nicked food. Excellent Barra Burgers too. Was closed for 7 years over the time of this article, but check out the transformation of the Commercial Boutique Hotel in Tenterfield – New England Tablelands… Stunning Art Deco restoration, great food and pours local craft beers & wines… a real salvation for an old hotel that was almost lost. Kudos to the family that took a chance on it. Tenterfield looks a different place now! If only I had the time too travel to all of the above mentioned pups. Although I am retired, I shall visit some as they all are totally Australian. All with their own great character and the locals who frequent them all have stories to tell. It would be a real experience to chat with them. Only in the outback can you find such historic watering holes. I have just reset my bucket list after reading this. My wife’s not going to be happy at all. Good bye Floriade, and all the botanical gardens in Australia.